There are two versions of patterns. The first is an online version where you can click on the numbers to view a picture of the obstacle, you can see the actual track taken when measuring the course and you can click on the print icon to print a copy of the map. The second version of the maps are printable PDF’s that use the grone pic above along with more detailed instructions. If you only have time for one, download the pdf’s. The trail course is open ever Wed for schooling. We are requesting that people sign up to give us an idea of who to expect and so the course doesn’t get too crowded. Back by popular demand is Ashley Gruber, IMTCA Certified Judge, who will be available for small group lessons Sat July 14th. It will also be a schooling day. Entry forms and on-line entry are now available for the Aug 5th and Sept 15 Trail Challenges. Scroll down for links. Both competitions will be eligible for the regions’ year end awards. A Challenge will test a horse and rider’s ability to navigate both natural and man-made obstacles in a safe manner and with technical skills that demonstrate great horsemanship. The Challenges are judged events designed to show the confidence, boldness and athletic ability of all breeds and disciplines of horses (including Minis) and mules while being challenged by trail obstacles. Judging combines technical and stylistic elements coupled with consideration of “degree of difficulty.” Each show will have three levels of difficulty that are designed to challenge but not intimidate riders. Attire and tack required for participating must be neat, clean and in good working order. Boots with a heel and HELMETS ARE REQUIRED OF ALL RIDERS! For more information on Mountain Trail go the International Mountain Trail Association’s website. We will be following the IMTCA Rules & will be using IMTCA Judges. 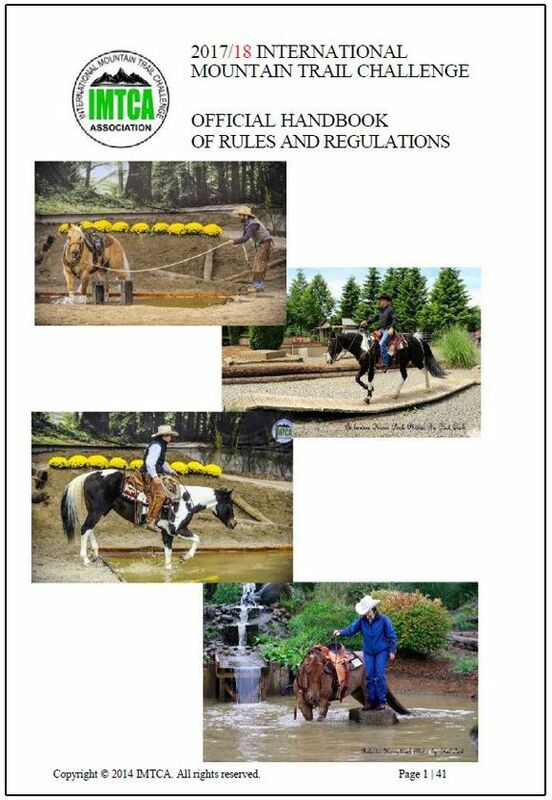 Check out the links for the IMTCA Rulebook and Judge Reference 2018.